Pacific Rim is, at heart, a throwback to the monster and mecha (“Kaiju” and “Jaegers” in the film) genres that are typically associated with the Japanese. In fact, director Guillermo del Toro has stated that part of his desire in making Pacific Rim was to introduce these genres to a new generation of moviegoers. 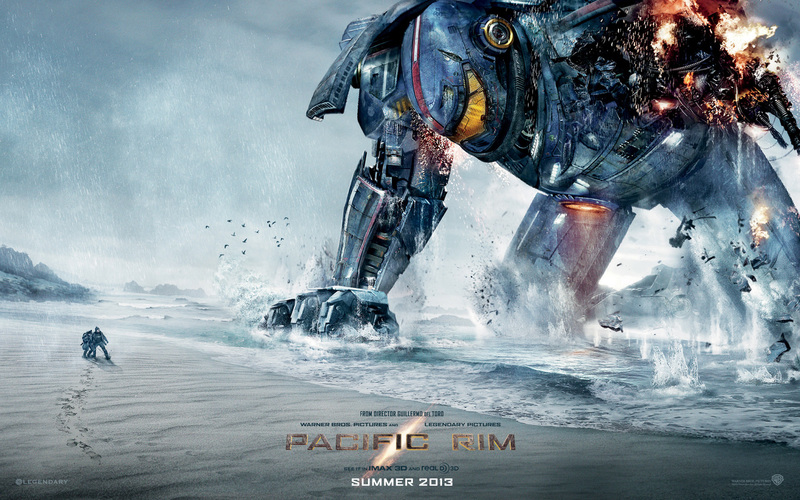 That’s all fine and dandy, but is Pacific Rim worth seeing? Unfortunately, the movie’s lack of logical storytelling took me out of the film on several occasions. I understand that there has to be some suspension of disbelief in a film like this, but the movie has to meet the viewer halfway. Pacific Rim wasn’t even consistent in its in-story logic. The view should not have thoughts that start with “Wait, I thought…” in the middle of the film. That is the movie’s fault. Most of the performances are competent. The script doesn’t give anyone much to work with, but very few elevate their roles beyond the script’s limitations. Idris Elba does a good job playing a boring Idris Elba. Pacific Rim’s best performance is Charlie Day as a “Kaiju-groupie” and researcher. He is energetic and easy to relate to, providing a spark to a film otherwise devoid of interesting characters. At the end of the day, the film lacked an interesting story, interesting characters, and any reason to invest emotionally in any non-Charlie character. So why would you even consider seeing Pacific Rim? For starters, it is pretty entertaining. Even if the film was much longer than it needed to be, I was never bored, mostly because of the stunning visuals. The visuals are easily Pacific Rim’s greatest strength. The Kaiju were interestingly designed and impressively rendered. The robots fell on some nationalistic clichés, (The Russian one is a bruising slab of metal, the Australian one is quick like a dingo, etc.) but they did help the viewer keep track of everything happening on screen. To the same effect, the combat scenes were well done. I was always able to keep track of who was who and what they were doing. Del Toro went with a more straight-forward style of action, rather than the equally atrocious poles of slow-motion fighting and the quick-cut confusion of Transformers or Casino Royale. Del Toro, as usual, tosses in some moments of levity, although some work better than others. The 3D was also well-done. Only once or twice did it go for the gimmicky “OH GOD IT’S COMING AT ME” moments and instead used it to add visual depth to the film. Weird concept, right? Overall, I was happy with Pacific Rim. That said, it was free and I went with a good friend who has a master’s degree in film. I probably wouldn’t pay to see Pacific Rim. Bottom Line: If you enjoy movies, you’ll probably find enough to like in Pacific Rim to get your money’s worth. If you enjoy film, however, you’ll probably leave unfulfilled. This entry was posted in Movies and tagged Charlie Day, Guillermo del Toro, Independence Day References, Jaegers, Kaiju, Logic, Mecha, Pacific Rim, Pacific Rim Review, Ramin Djawadi by Rites of Patches. Bookmark the permalink. Thanks for not spoiling anything! If it’s better than Transformers, it’s probably worth my time (since I paid to see each one of those diminishing-returns crapfests). Is it better than Into Darkness? I think you’d find some things to appreciate for sure. It was an inverse Transformers for me. I hated the action scenes in Transformers, but I never felt I was smarter than the movie (The first one, at least). I definitely felt that way in Pacific Rim. You know the issues I had with Into Darkness, but I definitely thought Into Darkness was more enjoyable and a better film. The.image of you and Dylan sitting around parsing a movie like Pacific Rim makes me pretty happy.